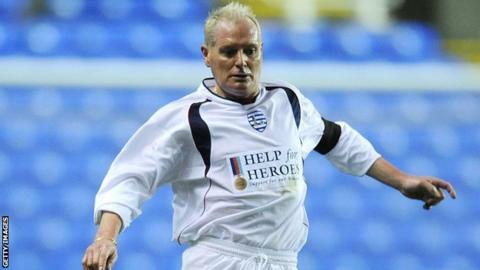 Paul Gascoigne needs almost 24-hour supervision after he started drinking again, PFA chief executive Gordon Taylor has warned. Gascoigne's agent Terry Baker said at the weekend that the former England footballer's life was in danger. Taylor, who has been in touch with Gascoigne, said the PFA had tried repeatedly to help the 45-year-old. June 1996: An alcohol-related "dentist-chair" stunt in a Hong Kong bar during England's Euro 96 preparations puts Gascoigne on the front pages of the newspapers in Britain. August 1998: Gascoigne's marriage to Sheryl ends after she is granted a quick divorce. The player left his wife with a black eye and badly bruised face and arm after he attacked her in a drunken rage in Gleneagles, Scotland. October 1998: He is admitted to the Marchwood Priory hospital to receive treatment for stress and drink problems. June 2001: Gascoigne admits himself to an alcohol rehabilitation clinic in Arizona on his Everton manager Walter Smith's insistence. May 2007: He undergoes emergency surgery for a perforated stomach ulcer. February 2008: Gascoigne is arrested in Newcastle and detained under the Mental Health Act. June 2008: The former England footballer is sectioned under the Mental Health Act following reports that he was acting strangely in Hemel Hempstead. "He sounds as if he needs almost a 24-hour watching brief at the moment," Taylor told BBC Radio 5 live. "It seems as if he needs somebody with him all the time just to make sure that he's looked after and is not going to do anything silly." Gascoigne was shaking and slurring his words on stage at a charity event in Northampton on Thursday. He has openly admitted to having problems with alcoholism, has spent time in rehab and was sectioned twice in 2008 under the Mental Health Act. Taylor said that the PFA paid for a detoxification programme for the former Tottenham and Lazio midfielder through the Sporting Chance Clinic a few weeks ago, but that he had checked himself out. The PFA chief executive has expressed fears that that Gascoigne could end up like former Manchester United winger George Best, who died aged 59 in 2005 after a long struggle with alcoholism. "It's a case of one step forward and two back," Taylor said. "I've spoken to Paul over the weekend, and he's said it's just a blip. But it really is down to him. We just don't want this to be another George Best tragedy. "He does need a big support system, and he's got it from lots of friends. But there is a frustration that when things look to be improving, it all goes off wire." Former Manchester United goalkeeper Peter Schmeichel has called on the PFA and Taylor to do more to help Gascoigne. After a video of the event in Northampton appeared on The Sun's website, Schmeichel wrote on Twitter: "This is not fun watching. Gazza needs help. Come on PFA and Gordon Taylor, time to step up." But Taylor said: "Peter doesn't know what we've done for Paul. "There isn't a player we've done more for over my time at the PFA. "In fact, we've been criticised for doing as much as we have, because he has not made the improvements that some of our other members have."